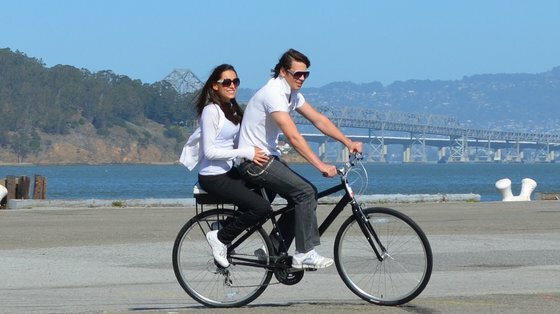 The companion bike seat is a seat that you can mount on the back of your bicycle, much like a rear rack. But instead of carrying luggage, it is meant to carry a person. I like the idea a lot. In the Netherlands, it is common practice to hitch a ride on the back of a bicycle, but it can be quite uncomfortable at times. This product addresses several issues that make it both safer and more comfortable. It adds pegs to the wheel for the feet to rest on so that they do not require constant effort to be held up. This is especially convenient for people with longer legs. (Most adults legs are longer than the height of a bicycle wheel.) The companion bike seat also adds some cushioning and raises the rear seat quite a bit, making it more comfortable. Most modern rear racks are only rated to carry a load of up to 25 or 40 kilos, while the companion bike seat goes up to 90 kilos (200 pounds,) which is more than enough to carry even a chubby adult. The most obvious problem with bicycles is that you can fall off, and with two people, the risk is doubled because two people can fall off. However, that is an obvious risk that you consciously take the moment you get on, so I see little reason to discuss the risk of falling off. What bothers me is that nowhere on the Kickstarter campaign page, installation guide, warranty page, or anywhere else on the company website do I see any mention of the required wheel strength. Many people buy cheap "convenience store" bicycles, with machine-built wheels which are made of lower quality materials and have a relatively low spoke tension. Lightweight sports bikes are made with high quality materials, but use fewer spokes in order to save weight. Overloading causes wheels to break all the time, because people simply do not think about it. Any product that facilitates carrying this much weight on a bicycle should inform potential customers about this. Putting the weight of two adults on a regular bicycle can damage it, and endanger your life. There is a reason why tandem bicycles are usually made with wheels that have at least 36 spokes. If you are riding with two people on a bicycle, you have to make sure the spoke tension is set correctly. If it is not, the wheel will break. It will probably be very dramatic and at an extremely inconvenient moment when you are going fast and hit a bump. The rim bends, spokes break, the wheel locks up and inertia throws you both off the bike. Hopefully onto something soft, but likely something hard. Additionally, if you are riding with almost double the mass, the requirements for the braking system are also higher. Again, no mention of this anywhere on the website. Another concern is the tire pressure. Most quality bicycle tires have a weight limit of around a 100 kilos. Since most weight is on the rear of the bicycle, this weight limit is easily exceeded. The tire has to be inflated at a much higher pressure to carry the weight of two people, and may need to be replaced with a stronger one (wider, with extra strong sidewalls) that can carry the weight of two adults. Again, the tire can fail dramatically. Overloading can cause blowouts where the sidewall of the tire ruptures and the inner tube literally explodes with a loud bang. Naturally, this will happen at an extremely inconvenient moment, causing you to lose control and crash. If you are lucky, you will not crash but keep getting pinch flats because your tire pressure is too low, and spend a small fortune on tubes because nobody told you that you are doing something wrong. This mountain bike has strong 26" wheels with wide tires and powerful disc brakes. It's no problem to carry another person on the back. This city bike is holding up for now, but you can see the rear tire is deformed so much that the rim is almost touching the ground. This can lead to so-called pinch flats. Luckily, the creators of the companion bike seat have not forgotten about safety entirely. On the bottom of every page it says "Remember, ALWAYS wear a helmet!". A nice gesture, while all pictures and videos of the product show it being used by people without any safety equipment. Since I have not seen any evidence that riding a bicycle in an upright position at a low speed significantly increases the chances of head trauma for adults, I cannot take this recommendation seriously. It seems a vain attempt to address a safety concern that some people might have, but fails utterly and just makes the whole thing look naive and a bit hypocritical. While we are on the topic of safety: the pictured product is shown with some reflectors on the back, but none of the bicycles have any rear lights installed. The companion bike seat lacks the standard mounts for a rear light, spaced 50 or 80 mm apart. I guess the holes can be drilled in the box, but as a manufacturer of bicycle components, you should try to adhere to existing standards. But this issue pales in comparison to the potential wheel failure. The companion bike seat looks like a lot of fun. Just don't take your fat friends for a ride, as it might get you both killed. I hope the makers start properly informing their customers, before it's too late.